Published: June 29, 2017 at 05:52 p.m. Updated: July 4, 2017 at 02:54 p.m. The hope in 2016 was that an increased workload for Lamar Miller would lead to even more fantasy scoring after back-to-back top-10 finishes. 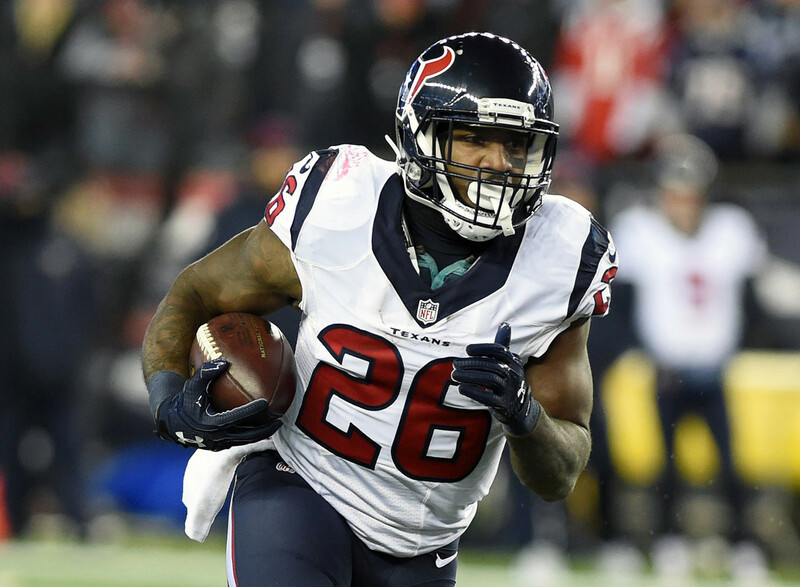 Instead, Miller posted his lowest yards per carry and yards per reception totals of the past three years, while also scoring just six touchdowns in the lackluster Houston attack. He'll still be a safe bet for high volume in 2017, but the Texans offense doesn't figure to make a massive leap in the scoring department with either Tom Savage or Deshaun Watson under center. In addition, the team drafted the big, bruising D'Onta Foreman, who could steal goal-line work. Miller will likely finish as a top-20 fantasy back, but shouldn't be drafted as a fringe RB1. Cooks is a fantastic player and should be an integral part of the Patriots offense. However, drafting him as a top-12 wide receiver is not only outrageous, but an historic gamble. Graham Barfield of FantasyGuru.com noted that since Rob Gronkowski joined the team in 2010, only two wide receivers in New England have finished in the top 12 in fantasy scoring. Tom Brady has a plethora of options in the passing game, so Cooks could be hard pressed to hit the 17 to 19 percent target share he's received the last two years in New Orleans. Cooks should be a solid WR2, but is currently be drafted ahead of more trustworthy WR1s like Doug Baldwin and Terrelle Pryor. I love Nuk as a player, but right now there are too many red flags around his situation to justify him as a top-12 wide receiver pick. For starters, he'll be playing with either Tom Savage or Deshaun Watson (as mentioned above). While it's reasonable to assume both should be an improvement over Brock Osweiler, it'd be foolish to think the gains in quarterback play would be anything more than marginal. Secondly, Hopkins' volume is likely to remain pretty static, and not approach the outrageous 192 targets he saw in 2015. Instead, he'll probably command between 120-150 looks, a reasonable share, but an amount that could make it harder for him to deliver upon his lofty draft price. Even if he bounces back to say, 1,100 yards and seven touchdowns, that puts him more in the WR20 range for overall scoring. Drafting him this high is chasing him at his absolute ceiling, which could end up costing owners in the long run if he doesn't deliver. The Falcons offense was a remarkable scoring unit in 2016, operating near peak efficiency. That was the case for Tevin Coleman, who scored an impressive 11 touchdowns on just 149 total touches for a TD rate of 7.4 percent, second-highest in the league for backs with at least 100 rushes (Mike Gillislee, 8.2 percent). Devonta Freeman should lead this backfield in touches, so to draft Coleman in the sixth round one must either expect him to a) see a healthy increase in touches or b) maintain his TD rate. From 2007 to 2015, 32 backs posted a TD rate over 5 percent, and only two improved upon that in the following season (BenJarvus Green-Ellis and Mike Tolbert from 2010-11, both by .4 percent). The average decline in TD rate over that span is 2.5 percent. However, shrinking the pool to just the eight backs with a TD rate of over 6 percent, the average decline jumps to 4.3 percent. Unless Coleman reverses this trend or sees a bunch more touches, he could disappoint. While Coleman has a pretty reasonable workload and role carved out in Atlanta, the Titans are still figuring out just how and when to use Henry. It's likely he increases his paltry 123 touches from his rookie year, but by how much? Head coach Mike Mularkey has repeatedly stated DeMarco Murray will remain the team's workhorse, leaving Henry for a complementary role at best. In re-draft leagues, the sixth round is far too high to take a back who won't likely return weekly starting value unless the guy ahead of him succumbs to an injury. This ADP makes a bit more sense in best ball leagues that don't feature a waiver-wire, but for most drafters, passing on Henry at this price is the right move. Kenneth Dixon's ADP baffles me. Not only is he suspended for the first four games of the season, but he isn't even guaranteed touches, much less the starting role, once he returns from said suspension. Terrance West is still hanging around and out-played Dixon last year, and the team added Danny Woodhead this offseason to absorb the backfield passing targets. I can see taking a stab at Dixon in the double-digit rounds for a depth play, but there's simply too much value still on the board in Round 8 to burn a bench spot for four weeks on Dixon while you wait for him to return from suspension. I get it. O.J. Howard was the best tight end in a talented rookie class and the Buccaneers drafted him in the first round. He's going to be a stud ... just probably not this year. Tight ends historically underperform in fantasy as rookies, and the team has already stated that last year's surprise breakout Cameron Brate will likely be the primary pass-catching tight end, with Howard slated for more blocking duties. Comparisons might be drawn to Hunter Henry from last year, but Henry was in an offense that had suffered multiple injuries to top wideouts, while the Buccaneers have reloaded the position this offseason by signing DeSean Jackson and drafting Chris Godwin. There will be a time when Howard will be an elite fantasy tight end. It just won't be in 2017. Pass on him in the 10th round and grab better values like Jack Doyle, Eric Ebron, or even Brate rounds later.